Tradition and Bridgeport High School football are synonymous. Understand, however, that tradition doesn’t strictly relate to winning and doesn’t strictly relate to what takes place when the game is in place. Tradition for the Indians is many things. For the last two years, one of those traditions was on display in Bluefield after the Indians dropped Class AA semifinal decisions to the Beavers. As is the case at the conclusion of the final game that ends with a setback, the underclassmen form a tunnel and wait to the side to allow Bridgeport Coach John Cole to deliver comments to the seniors. While I’m certain those young men would much rather listen to Cole after a state title win, hearing him speak to the collective group was something special indeed. Cole’s words were powerful. They were last year and he one-upped himself this year. After his comments, which are personal so they won’t be shared here, the seniors then went through and received comments, hugs and handshakes from their teammates and assistant coaches. It ended with each having a one-on-one with Cole, which I was also fortunate to be within earshot. Again, Cole delivered. At what was arguably one of the most disappointing days in the lives of the young men that played, John Cole put a few smiles on some crying faces and put ease on the minds of all. After the last of the group went through the tunnel and talked to the coach, Cole went to deal with the media waiting for him. He asked for a second to gather himself as, for every positive reason imaginable, he was overcome with his own emotions. He quickly gathered himself after having to say goodbye to a group of young men that was hard to say goodbye to. You know what? Any coach would have had a difficult saying goodbye to a group. I can still remember when this group came in as sophomores and the expectations weren’t state titles or ‘AA’ semifinals. Rather, the question by some was whether they would continue the Indians’ postseason streak. A few even suggested the non-losing season streak record was also in jeopardy. Cole alluded to the group’s arrival at BHS as we chatted by ourselves in the cold wind at Mitchell Stadium. “I think a lot of people don’t realize that if you looked at them in the eighth grade and even as freshmen, they weren’t very successful,” said Cole. “Those kids stuck with the program where a lot of times kids not doing well would have left. That didn’t happen here. We had a good, strong senior class. Cole didn’t know what he had on his hands when practice began in late July. He wasn’t even quite sure after the scrimmages. What he was sure of, heading into Bluefield months later, is his team had overcome adversity and later in the year found their footing to turn in another incredible campaign. After the game, his thoughts were confirmed from an unbiased and up close spectator who not only had a keen interest in the ‘AA’ semifinal, but likely watched all 12 of Bridgeport’s games this season in a way most of us don’t. “(Bluefield) Coach (Fred) Simon and some of the other coaches congratulated our kids and talked about the progress he saw. You know, we trade 12 films with each other,” said Cole of how staffs are able to review all of their playoff foe’s games. “He told me from that Fairmont Senior game until now was a really impressive turnaround and improvement. The turnaround Simon saw came after dropping a 45-14 decision in week five to top-ranked Fairmont Senior who battled Bluefield Friday for the state title. It was a game that was followed by eight straight wins by a group that struggled mightily when coming up through the BHS farm system. It was a game that sprung the team forward to an 11-2 finish and the Nov. 23 semifinal appearance. It may not have seemed possible a few years ago. But the kids did what their coaches told them. They followed the process and bought into the tradition. Because of that, they ended up making some tradition of their own. They also made an impression on Cole. 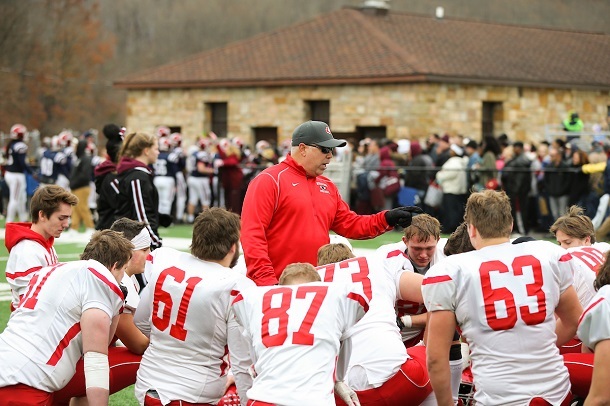 Editor's Note: Top photo shows Coach John Cole talking to his seniors after their Class AA semifinal loss. 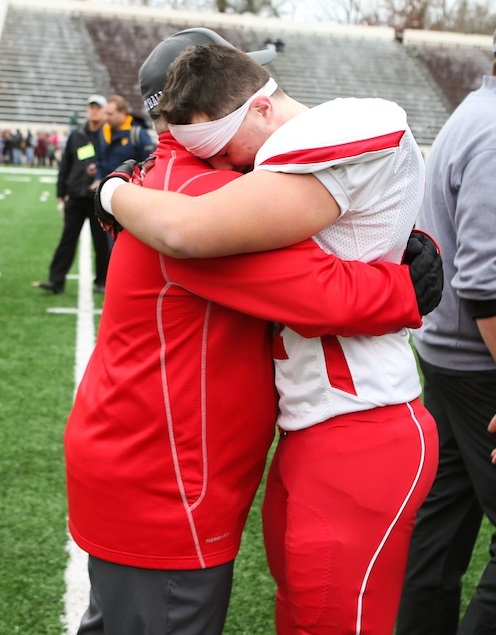 Second photo shows Cole consoling senior Carson DeMotto following their walk through the underclassmen tunnel. 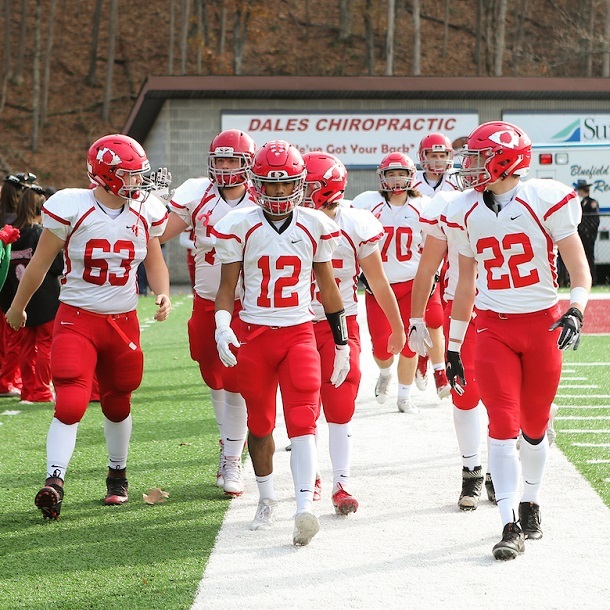 Below, several of the seniors head to the field prior to kickoff. Photos by Joey Signorelli of www.benqueenphotography.com.